Often looked upon as the only real jewellery for men, nowadays luxury watches are much more than just accessories telling the time. In recent years, master watchmakers have surpassed themselves by creating ever more impressive models. 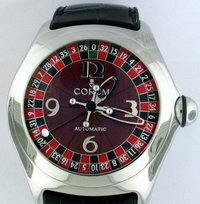 The latest innovation, “casino watches” are pure technological marvels for gambling fans. As you can imagine, we just couldn’t resist reviewing some of the most representative of this current trend. Launched at the Only Watch charity auction in 2011, the Bell & Ross Casino Pink Gold & Carbon is an exclusive, limited edition model sold by Bell & Ross. Based on the Franco- Swiss watchmaker’s famous BR01, this luxury watch has an exact copy of a casino roulette wheel on its face. The system has a mechanism with three concentric imprinted discs showing from top to bottom, minutes, hours and seconds. Completely luxurious, the watch has an 18 carat pink gold case finished in carbon. The strap is alligator skin. Approximate price: $25 000. With its BR01 Casino series, Bell & Ross has combined the aviation and casino worlds to offer really unique watches. In this case, just like for the previous watch it’s not a question of playing roulette on the watch but of reading the time in a different way thanks to the system of three concentric discs. OK, we’ll tell you how it works! The top disc shows the minutes in the middle “0”, the central disc with the white ball shows the hours and finally, the last disc with the picture of the roulette wheel and the arrows shows the seconds. A mechanical master piece. This little jewel costing just over $20 000 has a black steel case covered in PVD with an alligator bracelet. It’s impossible to talk about the latest casino- watches without mentioning models from the Monte-Carlo Casino by Christophe Claret range. A great blend of luxury, entertainment and interactivity these are real miniature casinos incorporated into ultra- luxurious watches. 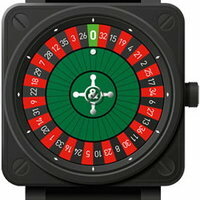 Launched in 2011, the range has three models: the Baccara (to play baccarat, roulette and craps), the 21 Blackjack (to play blackjack, craps and roulette) and the Poker watch (to play Texas Hold’em). These exceptional watches are made of white gold and titanium with rubies, sapphires, diamonds and an emerald. This is reflected in the price….$200 000 to $250 000. A slot machine integrated into a very high class watch is what Girard-Perregaux has successfully produced with the Whirlwind Jackpot. Thanks to its complex mechanism, the owner of this adult toy can enjoy all the excitement of a casino slot machine. The various materials used in its manufacture, the impressive number of components and its small pink gold case make it a unique piece of jewellery sold as a limited edition at $625 000. In the Corum Bubble Casino range we find small modern watchmaker gems designed to transmit all the intensity of the main casino games. 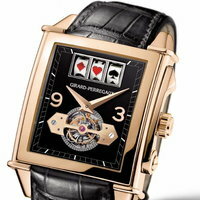 The watches show winning poker wagers with steel or 18 carat pink gold cards. Prices from $4 000. Some models with diamonds are also available.